I'm not sure how much of a picture this gives of my reading, since a great deal of it is piecemeal (especially with poetry) and not shown here. But it is a part-picture of a ramble through the year. And you can probably puzzle out something or other about my current manuscript by a study of these books. Currently I'm reading some MacFarlane, some Denis Johnson, and various poets. Again, the poetry is mostly piecemeal. The most accurate portrait of my poetry reading over a year would be a fat anthology I make myself, including a good bit of Yeats. I've only listed poetry here if I read a complete book. I point that out for those of you who might possibly pass by and wonder why your book is not listed--must mean I have not read the entire thing as yet! Attila József, Perched on Nothing's Branch: Selected Poems. 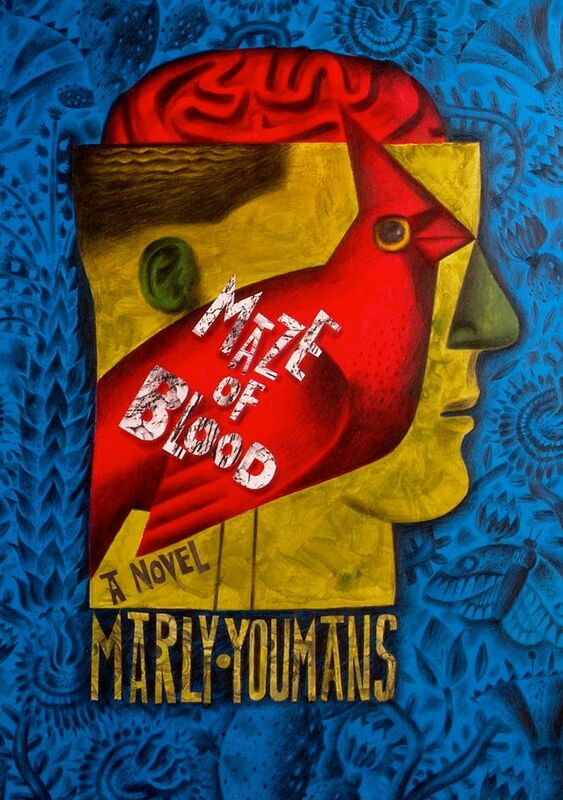 Translated from the Hungarian by Peter Hargitai. Foreword by Maxine Kumin. Buffalo, New York: White Pine Press, 1999. Academy of American Poets Translation Award. Don't miss József's "Curriculum Vitae" at the start, as it will be an effective way for you to break into tiny, sharp pieces glazed with tears. Poem snip: "Shadows of silverfish sweep the corals, / usher in the blackness, flutter on soft sand; / they touch tired snails and fall asleep for a long time..."
Bible. Various forays into the library of books that we call The Holy Bible. Took a class on Genesis and one on Exodus. 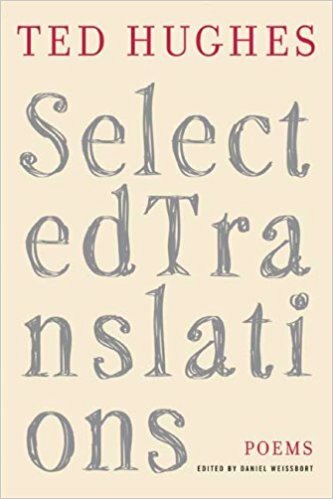 Have been reading KJB, NRSV, Robert Alter's translation of Genesis, and David Bentley Hart's brand new translation, The New Testament, meant to mimic the style of the Greek, even where rough, impetuous, and careless as to tenses. It was lauded recently in The Atlantic. A more tempered view by Wesley Hill here. C. Day Lewis. The Poetic Image. Still pertinent and well worth reading. Essays/lectures from someone who understands literary history and the Modernist place in it for good and for ill. "The Lyric Impulse" is a great introductory piece. I thoroughly enjoyed the whole book. 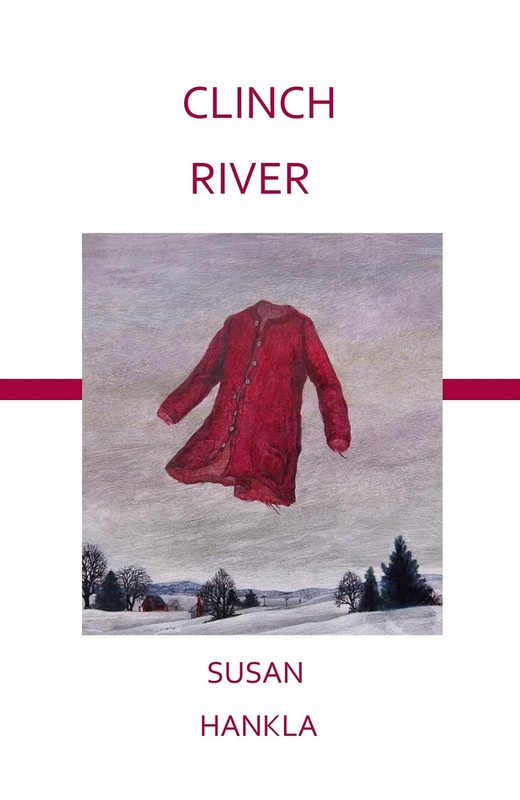 Highly recommended for those interested in song, ballad, and shapely poems. C. P. Cavafy, The Complete Poems of Cavafy, translated by Rae Dalven, with an introduction by W. H. Auden (Harcourt, Brace and World, 1948.) 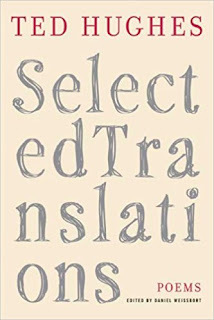 Auden: "The most original aspect of his style, the mixture, both in his vocabulary and his syntax, of demotic and purist Greek, is untranslatable." Every now and then I feel drawn to reread Cavafy in various translations. I love the way he writes of things historical! 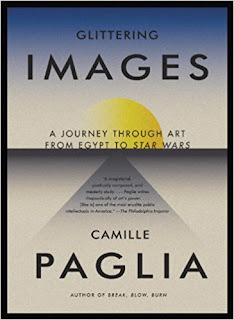 Camille Paglia, Glittering Images: A Journey through Art from Egypt to Star Wars. (New York: Pantheon Books.) 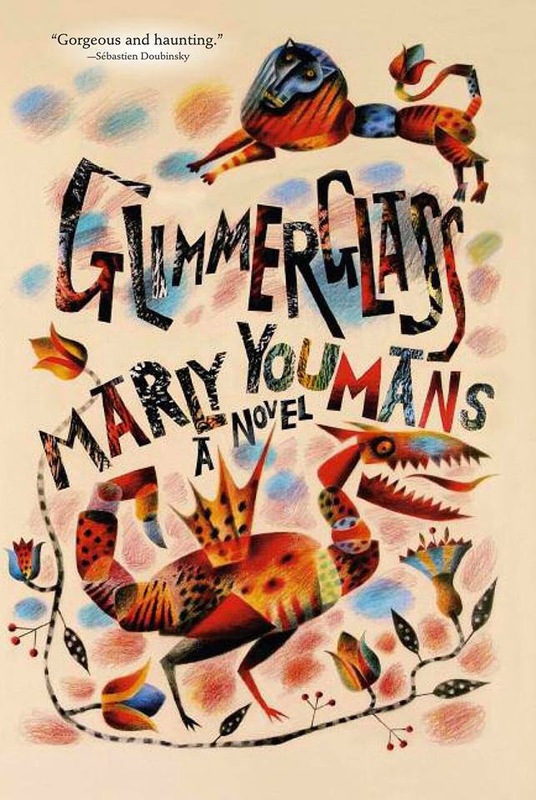 I read this aloud to my husband on our drive to my mother's house in western North Carolina in October and finished it up on the way back to our home in upstate New York. Some of her speculations are of the very sheerest, but it's a great read if you love art and don't care for the sterility and jargon of much arts criticism. Enthusiasm and respect for spiritual search inform the book. With the early works, the miracle of survival of ancient art and the admiration for the distinctive styles and crafts of shaping wielded by ancient, anonymous people are on Paglia's mind. And if you feel at all uncertain about the history of Modernism, she'll help you out in understanding how one sub-movement reacted to another. (And I must say that she managed to make me see Mondrian in an surprising new way--I had no real sense of what Mondrian thought that he was doing and found him surprisingly symbolic in his mode of conceiving and carrying out paintings.) I like and agree with her ideas of Warhol (or Mapplethorpe) as the dead-end of the avant garde, and I think those ideas translate well to what happened with poetry in the twentieth century, particularly when you look at how both painters pursuing realism and narrative and poets pursuing formal variety (including some ancient forms) and a widened subject matter are slowly gaining ground. Paglia is my favorite feminist because she insists (mightily!) on formulating her own thoughts without a whit of care for the winds and trends of culture in an era when academics tend to march together. A CLOSET for Ladies and Gentlewomen, or the Art of Preserving, Conserving, and Candying. With the manner how to make divers kinder of Syrups, and all kinds of Banqueting-stufs: Also divers Soveraigne-Medecines and Salves. London: Printed by R. H. [Richard Hodgkinson], 1651. I loved holding this one in my hands and wished I could put it in my pocket (tiny!) and take it home. Cordial waters, preserves, candying, medicines. I've read some other books like this one (I won't list them all!) in the past year, and they are invariably enjoyable--there are some online. Read in a 90-degree cradle at The American Antiquarian Society, AAS. C. S. Lewis, The World's Last Night. Essays. Here's a favorite clip on culture and on what is "real and live and unfabricated": "But when the things are of high value and very easily destroyed, we must talk with great care, and perhaps the less we talk the better.... For the true enjoyments must be spontaneous and compulsive and look to no remoter end. The Muses will submit to no marriage of convenience." Cynthea Masson, The Alchemist's Council. I had failed to pack a book for my flight to Japan, and an ARC of this novel was the sole volume on the United book-giveaway shelf, so of course I had to take it along. The author is a Canadian professor who had a postdoc fellowship in medieval alchemical manuscripts at The British Library. As I used a more traditional mode of alchemy to structure a forthcoming book (written some years back), I'm always interested in seeing what others do with alchemical meanings. The realm is complicated enough that the author is forced into info-dumping at times, but it's ingenious, using strange erasures that bring memory losses and an elaborate linkage between scripts and our world. And bees! I left it at an onsen on Sado Island, so perhaps it found someone who can read English. 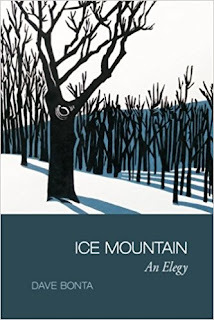 Dave Bonta, Ice Mountain. An Elegy. (Montreal: Phoenicia Publishing, 2017.) Design and woodblock illustrations by Elizabeth Adams. With an interesting essay by Dave about his inspiration from 3eanuts and much more. I know Dave through qarrtsiluni, a meeting in Wales, Via Negativa, and mutual friends. 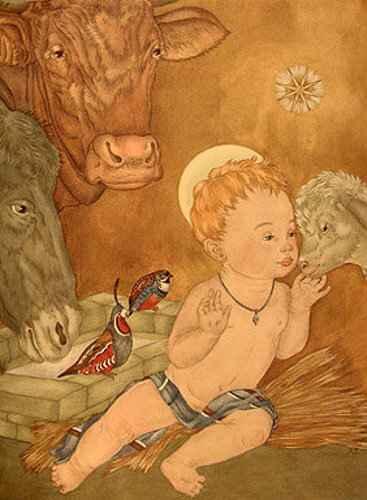 "at the top of a hemlock tree / a porcupine sleeps / in a sunlit halo of quills." David D. Hall, Worlds of Wonder, Days of Judgment New York: Knopf, 1989. 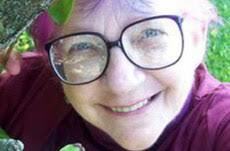 Hall looks at learning faith via gaining literacy and the sacred nature of text. Interesting on the reading matter of the godly (and the less so) of Mass Bay, as well as the wonders and "remarkables" of the time. More on the Sabbath, Sewall, etc. I knew a lot of the material discussed already but still found it interesting. Checked it out at AAS and then ordered a copy--well worth the read. David Schmer Svahn. Conflict and Genius: A Brief Introduction to a Complex Man--19th Century Scholar, Poet and Priest. William Wilberforce Lord 1819-1907. Doylestown, PA: Otsego Press, 2017. Bassett doctor and amateur historian David Svahn wrote this account of W. W. Lord, poet praised by Wordsworth and eviscerated by Poe, priest who served in the siege of Vicksburg and at Christ Church Cooperstown, where he got into a colorful ruckus! Great book for Cooperstonians and people interested in nineteenth-century poets, thinkers, and clergy. Reviewed for the local Christ Church Chronicle. E. M. W. Tillyard, The Elizabethan World Picture. Just as good as it was years ago. Eustace Mandeville Wetenhall Tillyard, former Master of Jesus College, Cambridge, going at chaos and order and the Great Chain of Being. French Poetry from Medieval to Modern Times, ed. Patrick McGuinness (New York: Everyman's Library, Knopf.) Read on a trip and need to reread. G. K. Chesterton, The Wit and Wisdom of G. K. Chesterton (New York: Dodd, Mead, and Company, 1911. LibriVox. I did not expect these to be so very good--the first half is wonderful. Listened to them while on the treadmill. Amusing and full of marvelous turnings and surprise. In his words, even the frailest of subjects become "thistledown...the roots of stars." The wonder of nonsense, a defense of public obsession with absurd facts, the decline in rash and impossible vows, the proper worship of babies (each a new world), and more. George and Weedon Grosssmith, The Diary of a Nobody. LibriVox. (Sir) George Webbe Dasent's translation of Popular Tales from the Norse (Norske Folkeeventyr) collected by Peter Christen Asbjørnsen and Jørgen Moe. 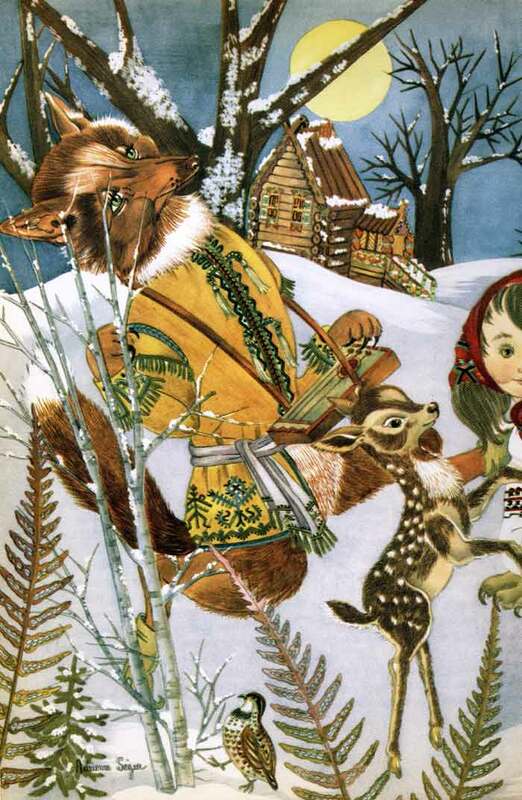 Folk tales. 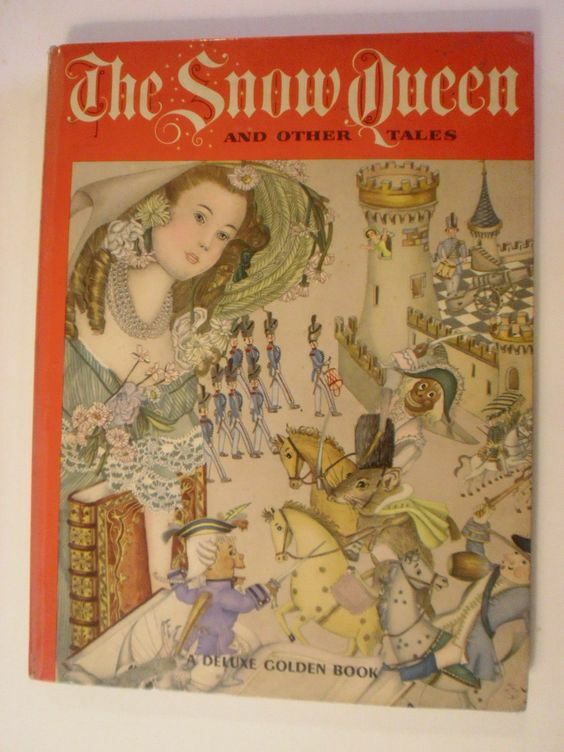 You may remember this book from childhood; I did. Tolkien referred to "Soria Moria Castle" as a possible name-source for his Mines of Moria. He also refers to Dasent in "On Fairy-Stories." 71 tales short and long, with a wild variety of voices and accents. LibriVox. Joanna Moorhead, The Surreal Life of Leonora Carrington (London: Virago Press, 2017.) 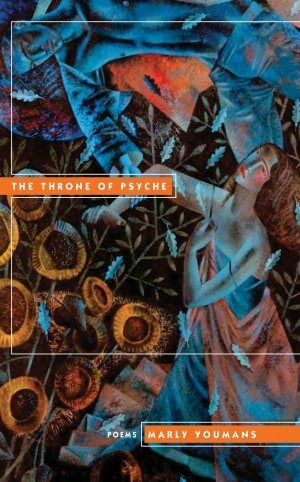 Reviewed in a round-up called "The Runaway Powers of Leonora Carrington." John T. Hull, The Siege and Capture of Fort Loyall: Destruction of Falmouth, May 20, 1630. A paper read before the Maine genealogical society, June 2, 1885. Portland, ME: Owen, Strout and Co., Printers, 1885. Hard to believe he read the entire book to the state genealogical society.... Though it is quite interesting. Read at AAS. John Dane, A Declaration of Remarkable Providences in the Course of My life. By John Dane of Ipswich. 1682. To Which is Added a Pedigree of the Dane Family, And a Few Notes. By a Member of the New England Historic-Genealogical Society. [Identified as John Ward Dane in pencil.] Boston: Samuel G. Drake, 1854. An account of some charm, full of temptations (a proto-Tom Jones!) and odd events. Influenced a passage in my novel. Read at AAS. I keep seeing this referred to, but with no sense that John Dane is closely related to the heroic Mr. Francis Dane, minister of Andover and defender of accused witches and wizards. James Turner Johnson, A Society Ordained by God: English Puritan Marriage Doctrine in the First Half of the Seventeenth Century. Studies in Christian Ethics Series. Nashville and New York: Abingdon Press, 1970. Kingsley Amis, Lucky Jim. 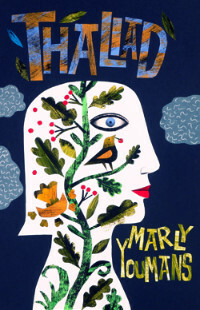 I read again after many decades and was surprised to find how well I remembered it, particularly the episode of the burned bedclothes and the "Merrie England" talk. The apex of the drunken address still reminded me of Fink-Nottle's, and antihero Jim Dixon of a sharper, less hapless and sweet Bertie Wooster. After being in the British army, Kingsley Amis must have been out to break all the campus rules.... Is Dixon sometimes roiling with class rage, spite, boredom, maliciousness, immaturity, self-contempt, and an Amisian-Larkinesque view of women? Sure. Here's Dixon in the morning: "Consciousness was upon him before he could get out of the way; not for him the slow, gracious wandering from the halls of sleep, but a summary, forcible ejection. He lay sprawled, too wicked to move, spewed up like a broken spider-crab on the tarry shingle of morning. The light did him harm, but not as much as looking at things did; he resolved, having done it once, never to move his eyeballs again. A dusty thudding in his head made the scene before him beat like a pulse. His mouth had been used as a latrine by some small creature of the night, and then as its mausoleum. During the night, too, he'd somehow been on a cross-country run and then been expertly beaten up by secret police. He felt bad.” Now I feel like rereading some Wodehouse and maybe The Loved One. Leena Krohn, Doña Quixote and Other Citizens. Portrait: Tales of the citizens of an usual city. I wrote about Doña Quixote here. Leonora Carrington, Down Below (New York Review of Books, 2017.) I reviewed Carrington books here. Leonora Carrington, The Complete Stories of Leonora Carrington (The Dorothy Project, 2017.) 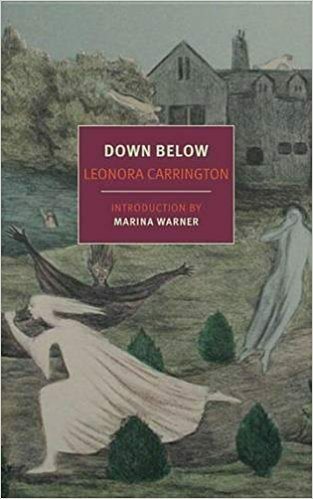 Reviewed in a round-up called "The Runaway Powers of Leonora Carrington." Leonora Carrington, The Milk of Dreams (New York Review of Books, 2017.) 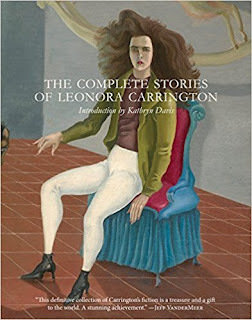 Reviewed in a round-up called "The Runaway Powers of Leonora Carrington." Michael Donaghy, Shibboleth (Oxford, 1988) Recommended poetry collection. "...the dive was there before the hawk was, / Real as a wind shear before the blown snow reveals it." Peter J. Bohan, Early Connecticut Silver, 1700-1840. Middletown, Conn.: Wesleyan University Press, 1870. This one also talks about earlier silver in the short text. Lots of images. AAS. Philip J. Greven, Jr., Four Generations: Population, Land, and Family in Colonial Andover, Massachusetts. Ithaca and London: Cornell University Press, 1970. AAS. Had to skim this one, as I didn't have it for long. Philip Larkin, The Whitsun Weddings. I wrote about this volume (and a bit about Charles Causley as well) here. Robert Alden Rubin, Seeing the Bones and Other Poems (read in manuscript.) This one will find a home eventually. Robert Forby, The Vocabulary of East Anglia--originally published in 1830. 2 vols. Fascinating. Robert Macfarlane, Landmarks (Hamish Hamilton, 2017.) Lovely, bumpy, tactile, strange place names in the UK. Rod Dreher, The Benedict Option. New York: Sentinel, 2016. Oddly, I found this book helpful in thinking about the feelings behind Puritan emigration and town establishment in New England. That is, it's really clear on communities needing to form in resistance to the dominant culture. In other ways, entirely different! The Saltonstall Papers, 1607-1815: Selected and Edited, with Biographis of Ten Members of the Saltonstall Family in Six Generations. Boston, Massachusetts Historical Society, 1972. 2 vols. I only used the first volume--some great letters, and the biographies were useful and sometimes contradicted earlier sources I had used. Great interest, and answered some questions I had. Read at AAS. The School of Good Manners, 1769. I finally learned the source of "the upper hand." When you're walking with another person, the right hand position is the one for the superior person. When three, he/she should be placed in the middle. (This reminds me of Darcy and Bingley's sisters walking in the garden, and Darcy's attempt to have Elizabeth join them. But no, they are "charmingly disposed." Or something like that.) Hey, and "Spit not in the Room, but in the Corner, and rub it with thy Foot...."
Steve Turner, Imagine. Basic. Very much in line with his International Arts Movement talk. T. McClure Peters, A Picture of Town Government in Massachusetts Bay Colony, at the Middle of the Seventeenth Century As Illustrated by the Town of Boston. Dissertation, School of Political Science, Columbia College. The McWilliams Printing Co., 1890. A highly useful little book to help understand town officers in early towns and Mass Bay governmental courts and structure. The number and variety of offices is surprising. And some offices are open only to Selectmen. Really curious and interesting if you like knowing such things! Read at AAS. Ted Hughes, Selected Translations: Poems, ed. Daniel Weissbort. (New York: FSG, 2006.) A bit of Homer, an opera text (a version, not a translation) for the Bardo Thödol, Ferenc Juhász's marvelous "The Boy Changed into a Stag Cries Out at the Gate of Secrets, and more. Wide variety in close, near-literal versions for the most part. Great collection for Hughes fans or for anyone who wants to take a look at a wide variety of writers. Thomas L. Purvis, Colonial America to 1763. Almanacs of American Life. Facts on File, 1999. (The Reverend) Thomas Morong, Puritan Life and Manners. An Address, Delivered in Ipswich, Massachusetts, at the Memorial Services on Forefathers' Day, Dec. 21, 1870, Together with a Notice of the Exercises on That Occasion. Boston: Lyman Rhodes, Printer, 1871. A good year-by-year source, despite a few oddities. Fat tabloid publication. Another one that it's hard to believe was a presentation because it's the length of a short book. People must have been more patient than we are. Read at AAS. 250th Anniversary of Ye Anciente Town of Haverhill. Worcester, MA: F. S. Blanchard and Co., July 2 and 3, 1890. A big fat tabloid publication. What a bargain for a mere 10 cents! Loved this crumbling, darkening source. So helpful. Read at AAS. [William Badcock.] W. B. of London, Goldsmith, Touch-stone for Gold and Silver Wares. Directing how to know Adulterated and unlawful GOLDSMITH'S Works, and the greatness of the Cheat therein; and how to punish the Offenders, and recover Recompence to the party wronged. Being a Treatise of great life for every Buyer of PLATE, and all Buyers and Wearers of Silver-Hilts, and Silver Buckles, and all other kind of GOLDSMITHS Works. The second Edition with Additions, Comprising the principal matters relating to the Goldsmiths and Cutlers Trades, and material things concerning all other Manual Trades. London: Printed for J. [?] Bellinger, in Cliffords-Inn-lane, and T. Basset at the George near Cliffords-Inn in Fleet-street, 1678. This is one I didn't get to keep long enough to read the whole thing, but it's fascinating and another volume that is tiny and packed and delicate. Read at AAS. Take a look! My choice was Susan Hankla's Clinch River, which I reviewed for The Hollins Critic. I'm adding an assemblage-update: I'm realio-and-trulio touched by the wonderful Gary Dietz putting me in his personal pantheon here. Gary is an all-around interesting person and a wonderful single father who has surmounted more challenges than most people ever face I'm putting a link here because I'm pleased by his tribute but also because it feels immodest to say so, and most of the people who will read this post have already passed by. So I suppose I'm hiding it in plain sight in order to say thank you, Gary--what a sweet man. When I woke, I was having such an obvious, complex dream about the state of arts culture and my own minor place in the hierarchy of that world that I'm still bemused. Talk about symbolic! It involved being in a large Checker cab with a bunch of male writers (including Bob Dylan) and no back door. I had that horrible dream sensation of forgetting something--in this case, my manuscripts to read--but was rescued by sending out a mental call for a very large bird to fetch them. Last year this print was a Christmas present (highly appropriate because "Gawain" is a winter's tale, a Christmas story), and this year my husband and I framed art from Clive Hicks-Jenkins, Beth Adams, Ruth Sanderson, and our Japan trip in time for Christmas. "The Armouring of Gawain" is the sort of thing I love; Clive Hicks-Jenkins elaborately links his image to a text. The medieval poem, Gawain and the Green Knight by the "Gawain Poet" or "Pearl Poet," is a splendid, fantastical, moral, green, magical thing. I haven't read it in a few years, but it is one of the long poems that I like to reread. Might be about time again. 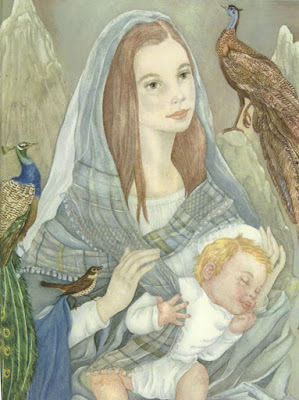 Why are Mary and the baby Jesus in Clive's print? The answer is tucked inside the poem. It is Christmas-time when the poem opens, and again when Gawain will meet the Green Knight a second time. Now, meet the young knight's shield. On Gawain's shield--part of the "armoring" of Gawain--shines a golden pentangle that symbolizes many things. The poet is frank about symbolic meaning. The endless knot of the star suggests the five wounds of Christ, the five moral virtues of the knight, the star of Bethlehem, and the "five joys" of Mary (Annunciation, Nativity of Jesus, Resurrection, Ascension, and Assumption.) The five senses and the five fingers of the hand are evoked. Thus earthly virtues, earthly gifts, and heavenly truths arm Gawain. The physical and the metaphysical will be tested in the course of the Green Knight's Christmas year-and-a-day beheading game. But there is more to why they are nested in the picture, and more to Gawain's shield. So why are they there, and why are the colors of this silkscreen are so markedly different from other prints in the series? Red and yellow gold dominate. Gawain's shield in the poem links up to the colors of the print. In the narrative, the inner surface of Gawain's shield holds an image of Mary. Here we see not the outer portion of the shield but the inside. On the silkscreen, Mary and the babe are backed by red, just as the shield in the poem gives us a red ground. Red in the medieval mind probably would have suggested the fire of Pentecost and the Holy Spirit, the blood of Eucharist, and the crucifixion. The gestures of the child Jesus are, while true to the movements of a baby, suggestive of both aspiration and the arms-up, arms-out position when Christ is hanging on the cross. Out there in the world, Mary and faith and the pent or five angles, gold on a red ground, will stand between the knight and danger. Gold, the highest and the most pure of metals, will lead the way. What about the little scene in the corner? Clive's castle evokes Camelot and knightly ideals, but its life has fallen into shadow. Perhaps Gawain carries away the light as he departs. The castle is defended by both crenellated walls and a moat; it contains church-like structures and phallic towers. In some ways, it is a protected realm where the knightly virtues are not tested. But in the poem, the Green Knight in all his barbaric-seeming color, power, and gusto breaks into that sheltered place. Then Gawain, the purest (the most like gold, the highest in a hierarchy) of the knights, must abandon castle defenses in order to go into a cold, turbulent landscape and search for that magical "elf," though he will carry virtues and shield with him. 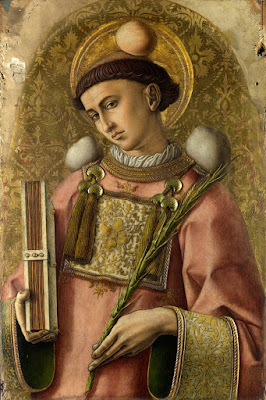 The cleverness of his hands, the senses of the body, and virtues will all be tested on the journey. The tidy red leaves shown here as part of his armor will give way to hardship in a less neat and controllable nature, and then to the vibrant green of the Knight. 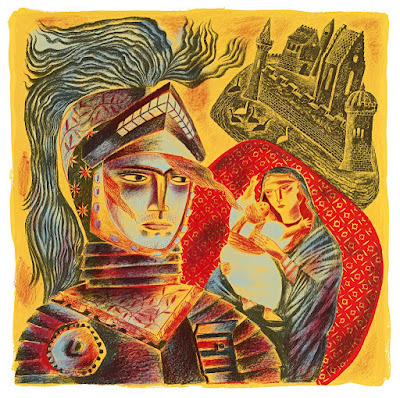 Gawain in the silkscreen is a sort of walking castle, a tower of metals, and the lively, spirited plumes that spring from his head seem another defense, a counterpart to the rippling moat, though they also hint at the wild winds beyond the walls and his own springing, youthful energy. But at Bertilak's castle, all defenses and armor will be stripped away, and Gawain will gain a new green garment to remind him of the lesson he learns there. Interestingly, on the moat in the silkscreen swim six swans, the birds that expressed fidelity to the medieval mind because thought to mate for life, unlike other creatures. I might have expected "seven swans a-singing" since it is Christmas at Camelot at the poem's start, but instead the artist gives us an even number, suggestive of pairs. And Gawain's forthcoming test from the Green Knight and Lady Bertilak will have something to do with pairs, faith, loyalty, and virtue. For more about Clive's collaboration with printer Daniel Bugg of Penfold Press, fly here. 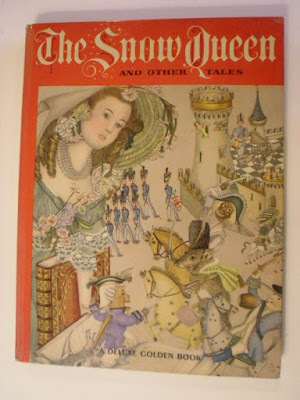 I pored over my copy of The Snow Queen and Other Stories when I was a small child as blonde and blue-eyed as an Adrienne Segur character. Later little gold crowns ringed my pupils and my eyes turned green. My hair would darken. 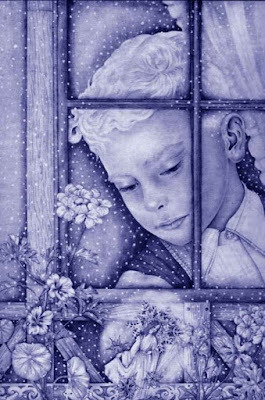 Back then I had a deep love for Segur's illustration that I now find was not uncommon among women writers around my age. Many of us had one (or two--the lucky ones!) 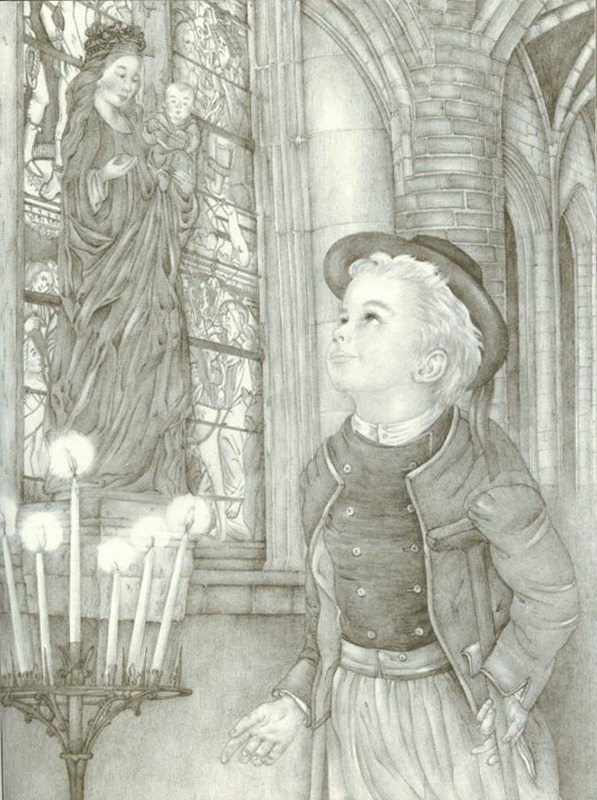 of the big story collections Segur illustrated for Golden Books. I bought the second one some years ago and wished that I could send it through time to the child-me. Instead, I shall send you a little card from child-me and current-me: Young Crone-me. Here’s Snow Day in the Writing Room. And a childhood favorite at Christmas. Here’s a poem for Christmas Day. 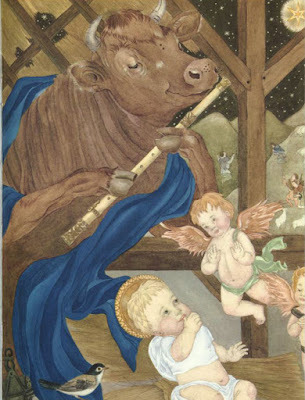 Maybe a little William Blake (1757-1827) to accompany that illustration? One of my favorite books as a child. Segur illustrations. 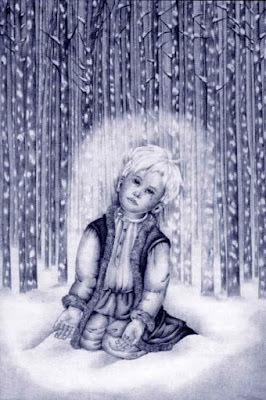 Segur, "Melito and his Soul"
Segur illustration, "La Rose de Noël"
Segur, for "The Legend of the Rossignol"
Segur detail, "The Little Girl Made of Snow"
Saturday, December 16th will bring a celebration of Bright Hill Literary Center and Press in Treadwell, New York. Founded by writer Bertha Rogers in the upper Catskills, the center is now 25 years old and promises to be overrun with poets and story makers all afternoon! Please come if you're in the area. Alexander Cigale via facebook: Immensely proud of my association with Bright Hill Press and this 25th Anniversary Anthology, with my deep admiration for its retiring director and editor, Bertha Rogers. If you're looking for a gift of poetry and redemption this holiday season, you will not do much better than this. I have two new translations of early Osip Mandelstam poems in the book, "Conch Shell" and "Lutheran" (1911, 1912). 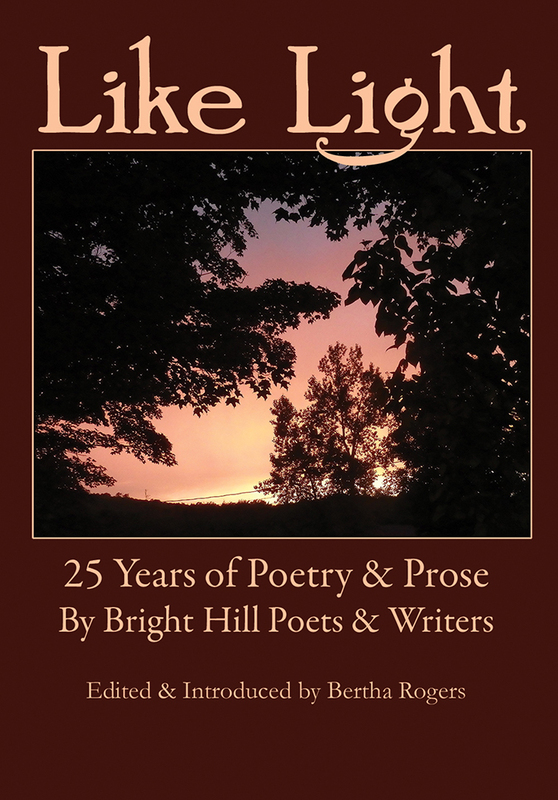 Please, consider helping Bright Hill continue its important work with a purchase. Nejat, Richard Jeffrey Newman, Constance Norgren, John Paul O’Connor, Sharon Olinka, Steven Ostrowski, Matthew Paris, Lynn Pattison, Ellen Peckham, Alice Pero, Jo Pitkin, Palline Plum, Georgia Popoff, Andrea Potos, Gretchen Primack, Lucyna Prostko, Suzanne Rancourt, Claudia M. Reder, Lisa Rhoades, Sherry Robbins, Bertha Rogers, Jay Rogoff, Liz Rosenberg, Charles Charlie Rossiterr, Sharon Ruetenik, Helen Ruggieri, Mary Kay Rummel, Thaddeus Rutkowski, Margaret Ryan, Barbara Salvatore, Terrence Savoie, Boria Sax, Myra Shapiro, Steven Sher, Steven Sherrill, Hilary Sideris, Karen Skolfield, Scot Slaby, Jordan Smith, Matthew J. Spireng, Susan Fantl Spivack, Claudia Stanek, Julian Stannard, Shelby Stephenson, Pamela Strother, Julia Suarez, Karen Swenson, Meredith Trede, Emily Vogel, Charlotte Zöe Walker, Barry Wallenstein, John Walsh, Chocolate Waters, Michael Waters, Bruce Weber, Joe Weil, Estha Weiner, Andrew Weinstein, Bhikshuni Weisbrot, Dan Wilcox, Malcolm Willison, Martin Willitts Jr., Teresa Winchester, Dayl Wise, Scott Withiam, Chavisa Woods, Carolyne Wright, Lisa Wujnovich, Don Yorty, Marly Youmans, Margaret Young, Michael T. Young. 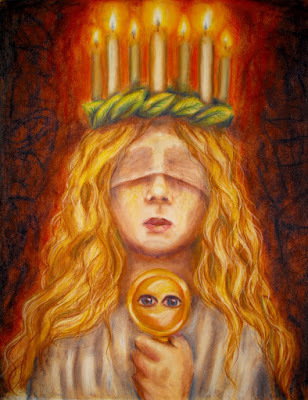 Saint Lucy (Lucia) of Syracuse as portrayed by art student Mary MacArthur of the Catholic Illustrator's Guild--she did this piece in a figure drawing class (and made a few additions) back in 2010. I had never heard of the CIG before this, but as I love Fra Angelico, I like their motto: Fra Angelico ora pro nobis. Instead of presenting St. Lucy's eyes on a gold plate, Mary MacArthur gives us what looks like the back of a hand mirror with the eyes peering out--an odd effect that looks like a small, surreal person gripped in Saint Lucy's hand. You can find out more about the young artist-illustrator here. 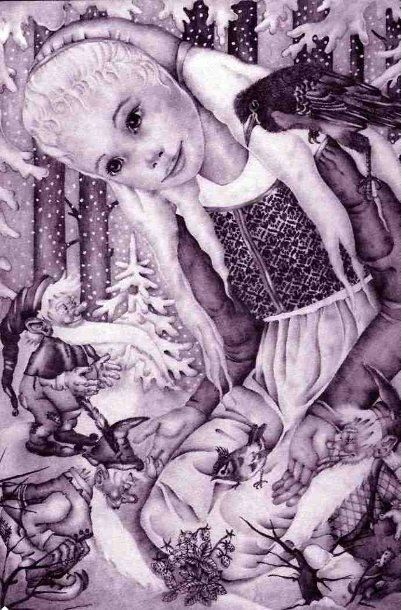 Evidently she has illustrated several children's books. In the literary world, Saint Lucia is probably most famous for her importance to Dante's The Divine Comedy. Why is she so meaningful to Dante? Light and poets ought to go together, certainly, especially when poets venture into dark places. Surely Dante desired light (a natural problem in earlier times), metaphysical and godly illumination, and also relief from the eyestrain he described in Convivio. 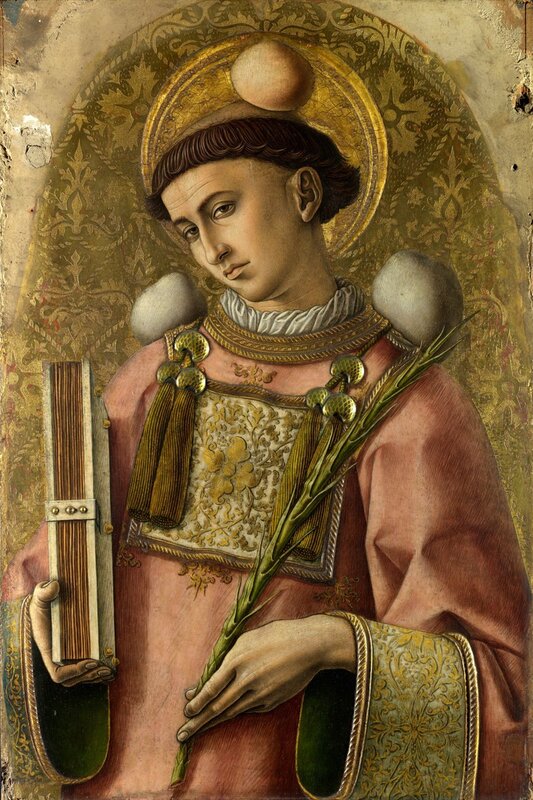 Wishing you light on St. Lucy's special day--and now I'm off to a celebration and dinner in her honor! Most of the art above is by Clive Hicks-Jenkins. The camellia photo was taken by Mary Beth Kosowski. Thanks to many grand designers and publishers--Mary-Frances Glover Burt, Elizabeth Adams, Marc Jolley, Andrew Wakelin, Pete Crowther. Why these images? Books currently in print. 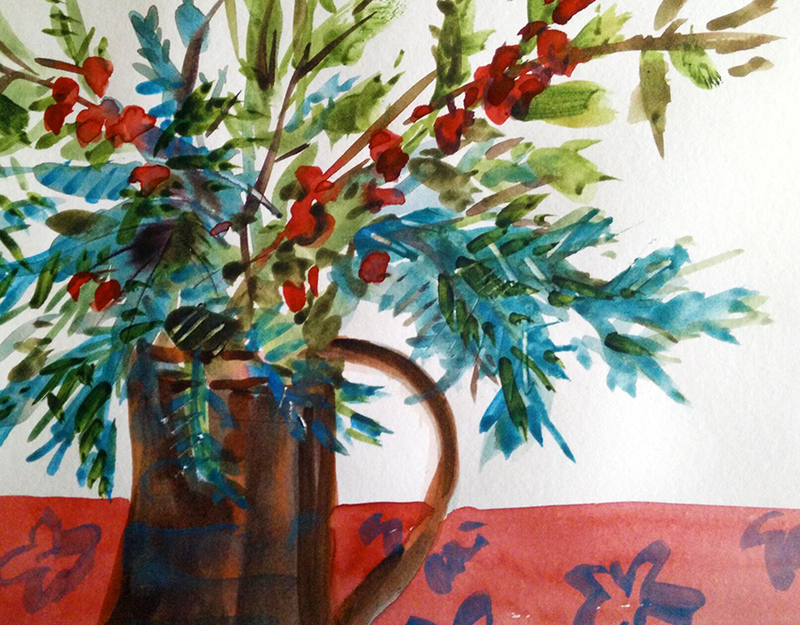 Beautiful December newsletter--take a look and think about supporting a fine small press founded by Beth Adams. 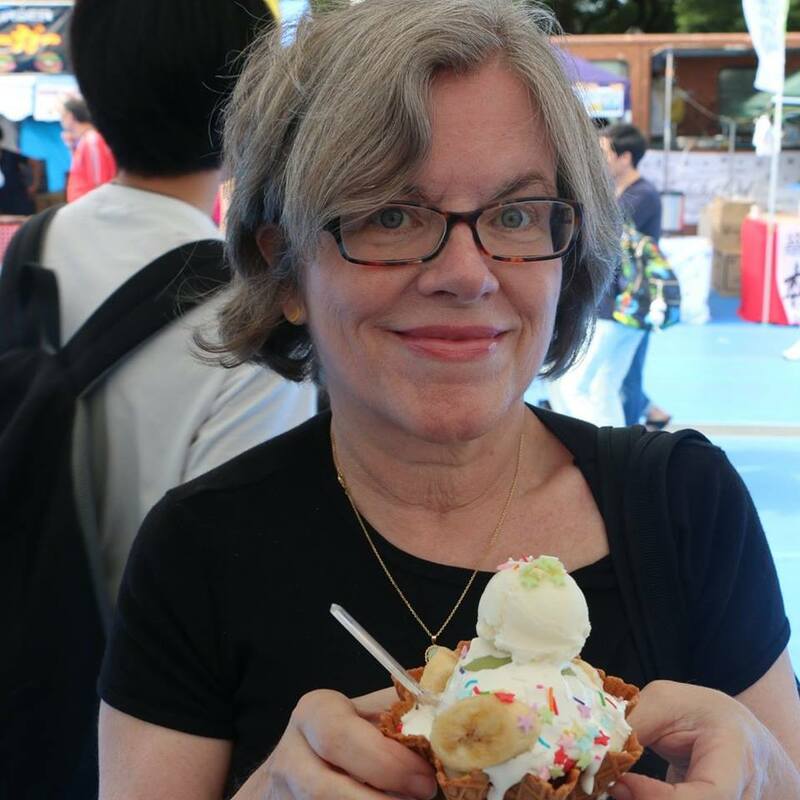 Small publishers need your love, your encouragement, and your financial support (that's a vote in favor of continued life for a small press) to do what they are doing. One-week holiday sale. I've pilfered a copy for anyone who might not be lucky enough to find one in their email or see a share on facebook or twitter. You can also see the original via MailChimp. 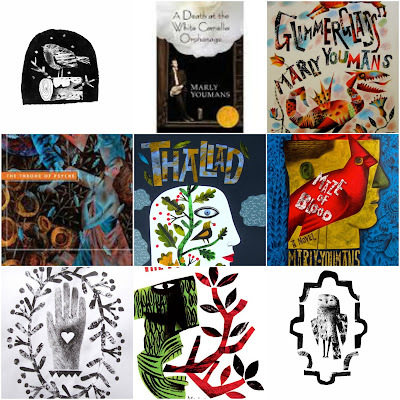 Here are a few suggestions of special books for holiday gift-giving -- or for yourself! Several are on sale for just one week, direct orders only. We also hope you'll visit our full catalogue this season, and give a gift that supports writers, artists, and independent publishing. Thank you so much for your interest and your purchases during past years! Need a perfect Christmas present, for just $12.00? 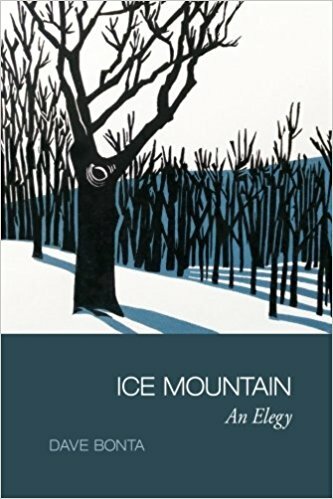 Dave Bonta's Ice Mountain: An Elegy, was one of three fiction/poetry finalists for the 2017 Banff Mountain Book Awards, and it's receiving glowing reviews from a wide variety of readers. On sale for the coming week, it's also a beautiful book, with illustrations any nature and art lover will enjoy -- some of which are available as original linocut prints, for a very affordable price. 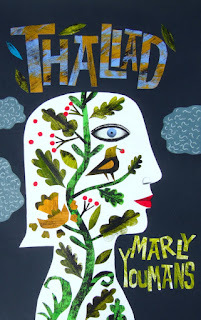 Last December, I gave a copy of Thaliad to a friend. 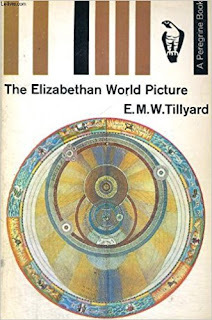 She ended up buying twelve more copies as gifts, and exclaimed over what an extraordinary work it is; she loved the overall design, the artwork by Clive Hicks-Jenkins, and most especially the story Marly Youmans tells in the form of an epic poem-novel for our time. Beautiful books with carefully wrought words and a timeless message are still sought out, because they are books that will last. Thaliad, a consistent Phoenicia bestseller, is available in both hardcover (on sale now) and paperback editions. 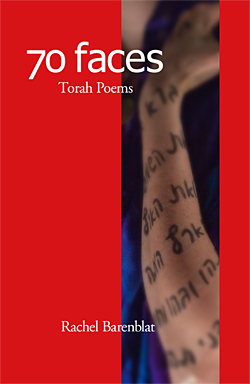 Jewish and Christian readers alike will appreciate the fresh insights and female perspective on the first five books of the Bible in acclaimed writer and rabbi Rachel Barenblat's 70 Faces: Torah Poems, Phoenicia's all-time bestselling book. Limited Quantity! 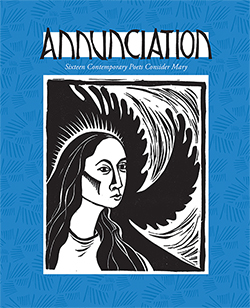 We're down to our last few copies of Annunciation, so please order early at a special sale price! This book of poetic responses by 16 interfaith and secular poets to the story of Mary has received wide acclaim for its broadly envisioned, thought-provoking words; beautiful design; and many linocut illustrations. It's a lovely and appropriate Christmas gift, and comes in an 8" x 10" softcover format. 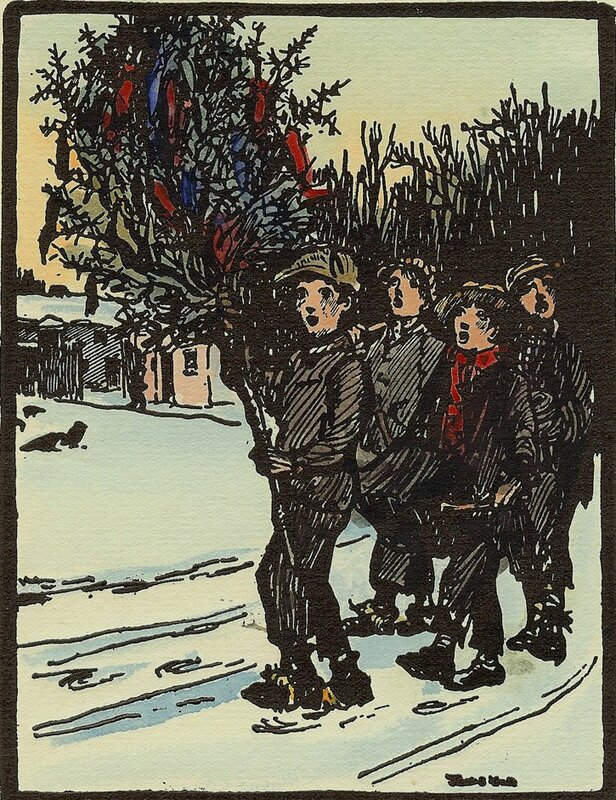 Several of the illustrations are also available as original linocut prints in our art shop. We'll be back in early 2018 with exciting news about Phoenicia's upcoming titles. 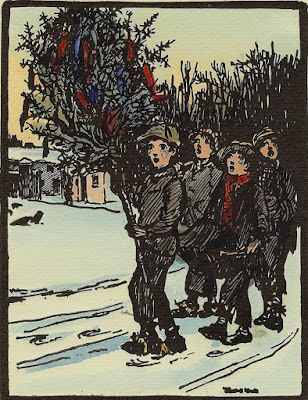 But right now, we wish you a peaceful and joyful holiday season, and thank you once again for your support of independent publishing and the authors, artists and musicians we publish.